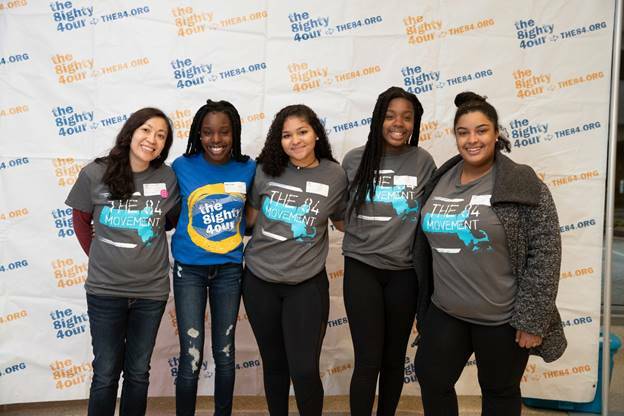 Members of the Watertown Youth Coalition who attended the Youth Power Summit in Worcester, (pictured from left): Dawn Graham (Adult Advisor), Shariel Joseph, Eva Henry, Shama Joseph, and Olivia Haggerty. Young leaders of The 84 Movement from the Watertown Youth Coalition attended the Youth Power Summit on October 27, 2018 at the UMass Medical Center in Worcester. Youth activists from around Massachusetts learned how the history of tobacco mirrors and is influenced by the history of race in the U.S. They shared stories and discussed activities to address tobacco-related inequities in their communities.